I’m not sure how to come up with words to do this book justice—magical? Intriguing? Eccentric? It was a fantastic read, full of rich detail and beautiful metaphor. In fact, the only reason I bumped a star off of this book was because it had too many metaphors and too much flowery writing for my taste. Though absolutely appropriate and well done in many parts, it became overdone after a bit and actually began to turn me off from the writing. The Catalain women are several generations of witches with magical powers—Ursula makes potions, Helena creates magical candies that can inspire patience, love, and much more, Jasmine can infuse her amazing cooking with feelings and spells. When Ursula is a young girl, her mother tricks her into helping her murder her father. In revenge, he casts a curse over Ursula and her future children. The book jumps through time to present day and switches points-of-view between all of the Catalain women to paint a vivid picture of their emotions, powers, and scars. Lourey does a seamless job of switching between women and painting a image of who they are at the core. All of the characters felt full, and nobody fell flat. I felt equally for each woman and didn’t choose favorites—in fact, it made me respect each one more because you knew what their past was and how it impacted their present day. I would definitely recommend this book. Once you get past the flamboyant writing style, you’ll find a beautiful, well-written story about a group of gifted women who are trying to heal. I rated it 4/5 on Goodreads. 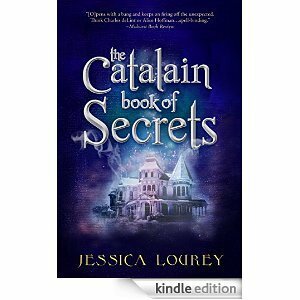 The Catalain Book of Secrets is due to be released on January 1, 2015. I received a free copy of this book through Net Galley in exchange for an honest review.